Charity galas are a great way to raise money to support the cause of your choice, as well as to bring people together to celebrate in style. Once you’ve hired the venue, planned the guest list and selected your theme, you may think the job’s done – but wait! What about the music? Arguably one of the most important parts of any good gala, it pays to take the time to get your music right, regardless of whether you opt for a DJ spinning tracks all night long or a live performer wooing the crowd. 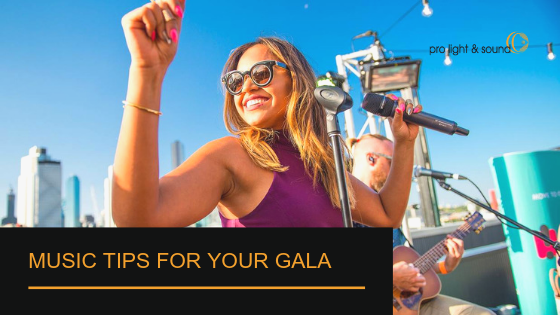 Take a look at these top music tips for your gala to make sure you get it right. All ‘features’ of your event should be planned to tie in neatly around each other. This means you don’t want to have your live band playing inside at the same time as your fireworks are going off outside, or your food coming out to the buffet just as the solo singer is getting started. To ensure you get the most out of all your featured performances, space them all out so their effect is maximised. Don’t put all the fun stuff back to back in the middle of the evening, and don’t let anything else distract from the performance. One important feature of your music is the equipment it’s played on. Using a specialist av equipment company to ensure you have professional speakers and microphones for a crisp, clear sound that will float over the whole crowd. You can have the best singers in Australia playing at your gig, but if the equipment they use isn’t up to scratch they will sound nowhere near as good as they should. If the musicians bring some of their own equipment, make sure you have a practice run-through to ensure all the technology works well together and you get the best sound possible. When it comes to the set list, make sure you have a conversation with the musicians to nail down features of the playlist you do and do not want to hear. Specific songs can be really helpful to guide musicians, and they will likely offer up suggestions of what they think your guests will want to hear. Pro Light & Sound are the go-to professionals for av equipment and av styling in Melbourne. If you are planning your next charity gala event, speak to a Pro Light & Sound professional to see how we can ensure that you have the best sounding event on the calendar!